Review of Sloan, Stanley. Defense of the West: NATO, the European Union, and the Transatlantic Bargain. Manchester: Manchester University Press, 2016. 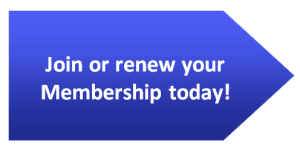 As a broad-based, grassroots organization, the NATO Association of Canada’s membership is comprised of men and women representing a whole cross-section of the Canadian public. They identify with the NATO cause and recognize the organization as being vital to their interests. However, many members of the general public might not know as much as they would like to about the broad history of NATO or what its current influence is in global affairs. Those who desire a more in-depth understanding of the alliance will find a handy companion in Defense of the West(2016),by Stanley Sloan. It is more than just an historical account of NATO. It is a comprehensive status report on the alliance that is at once an appraisal of its continued worth and a frank diagnosis of its vulnerabilities. This is indispensable reading for any student of NATO, and the rules-based international order in general. Sloan does an excellent job of cataloguing the watershed moments in NATO’s history that fundamentally changed the character and direction of the organization, and demonstrates how those developments are still playing out today. Sloan’s prose is dry and to the point, but he provides the reader with an accessible, easy-to-read survey of NATO, chronicling its history, explaining its unique value, and underscoring its current place in the North Atlantic community and the world. It is not uncommon – either in the academy or at the level of popular politics – to hear the cliché that NATO is a “relic” of the Cold War. But the division of content in Defense of the Westbelies this idea. Sloan only devotes the first 100 pages of his nearly 350-page tome to NATO’s Cold War history. The bulk of the text is his account and analysis of post-Cold War developments in the alliance, including a deft examination of its most critical decade – the 1990s – and an assessment of the 21st-century developments that have irrevocably changed the organization. In some respects, NATO has become more versatile and multifunctional since the end of the Cold War. Not only has its political character shone more brightly since then, its military utility has also been on full display, as it has become an indispensable element of Allied military commitments undertaken in the wake of the invocation of Article 5 of the Washington Treaty after the 9/11 terrorist attacks. The story of NATO is really a tale of two continents. The origins of the organization go back to the distinctive foreign and domestic policy objectives of the United States and European countries in the immediate post-World War II period. In order to effectively deter Soviet expansion, the United States needed a strong Europe to serve as a bulwark against Moscow, but Europe was too crippled by the war to serve this purpose unless its economy was restored by the United States. For their part, European leaders were anxious to rebuild their countries’ shattered economies and, especially in the case of the imperial powers, reassert their claims to colonial possessions. Mutual interests and postwar enthusiasm for multilateralism prompted both sides to strike a “transatlantic bargain.”Its terms, as Sloan explains them, were that European states would work toward mutual cooperation and collective defence so as to ensure that their continent remained stable, in exchange for U.S. economic aid and commitment to European security. Since the creation of NATO, the great balancing act faced by the United States has been one of reassuring Europeans about the American commitment to European security while justifying the cost of such a commitment to the U.S. Senate. This has become more challenging in years gone by, as alliance burden sharing has become inequitable, sometimes in the popular imagination more than in reality. Americans, in particular, have become sensitive to the perception that they do most of the ‘heavy lifting’ in NATO. One wonders how many American policymakers and statesmen, especially in the Euroscetpical GOP – so often disdainful of the EU and the project of EU integration – know that centralization of the European continent was an Americanforeign policy goal, in fact, one of the very terms on which it conditioned rendering aid to the beleaguered postwar continent! NATO is something of a stubborn anomaly for the “realist” school of international relations, which sees states as being locked in a struggle for security in an anarchic world, in which egocentric national interest determines state behaviour, not the value system or ideological worldviews of states. For realists, alliances are temporary arrangements states pragmatically embrace solely for the purpose of securing the national interest, discarding them when they have achieved that objective. This attitude is epitomized in the oft-cited maxim of nineteenth-century British statesman, Lord Palmerston: “nations have no permanent friends or allies, they only have permanent interests.” For realists, NATO was a means to an end for postwar North American and Western European states, a way of balancing the Soviet Union, which threatened to overwhelm the international order. But if the NATO alliance was a covenant entered into by these states in common defence against the Soviet Union, then why has the alliance endured beyond the demise of its purported raison d’etrein 1991? The disappearance of the common Soviet threat has not led Germany and France – old adversaries – to remilitarize their border now that they no longer ‘need’ one another. Not only has the alliance endured, it has dramatically expanded! The explanation, Sloan suggests, can be found in the common liberal democratic value system of the member states that prompts them to do what seems illogical from the realist point of view and “co-bind” with one another, to borrow a term coined by G. John Ikenberry. One of the interesting insights Sloan provides is that the North Atlantic community and NATO are not exactly one and the same thing. The North Atlantic community is a civilizational bloc of states bound by durable common cultural and moral values – an almost Kantian ideal. NATO is the multilateral security expression of this bond, as Sloan says, “an affirmation of the moral and spiritual values which we hold in common” (9). Among these are the liberal democratic values affirmed in the preamble to the North Atlantic Treaty: “democracy, individual liberty, and the rule of law.” The legitimacy and durability of these values in the North Atlantic states means that, even if NATO ceased to exist, the North Atlantic community would endure. However, Sloan does speculate that if the United States and Europe drift too far apart in their respective value systems, it could spell the end of the two continents’ hitherto common feeling. Canada gets little mention in the book, which will disappoint readers seeking the history of our country’s participation in NATO. However, this is not an expectation the reader can hold Sloan to. His text is, above all, a bird’s-eye view and sweeping history of the alliance since its founding and, therefore, it is simply unfeasible for him to offer an in-depth treatment of every member state’s place in the alliance. Still, Sloan does touch on certain aspects of Canada’s role in NATO that would be interesting to explore in greater depth. For example, he mentions at the beginning of the book that Canada put particular emphasis on the political values of NATO at its founding, in contrast to other states that stressed its military dimension. However, he does not elaborate on this. If Canada emphasized the political character of the organization in the 1940s already, then history proves that to have been very prescient of Canadian officials, as NATO has become more of a political organization ever since the Harmel Reportof 1967 ensured that political engagement and reconciliation with adversaries would be part of the organization’s mandate. Sloan could also bring the North American Aerospace Defense Command (NORAD) – in which Canada plays a key role – into his history of NATO. Although NORAD is an exclusively North American military command, it was a key pillar of the North Atlantic security constellation that was integral to Allied Cold War strategy, especially that of deterring the Soviet nuclear threat to the North American members of the NATO alliance. 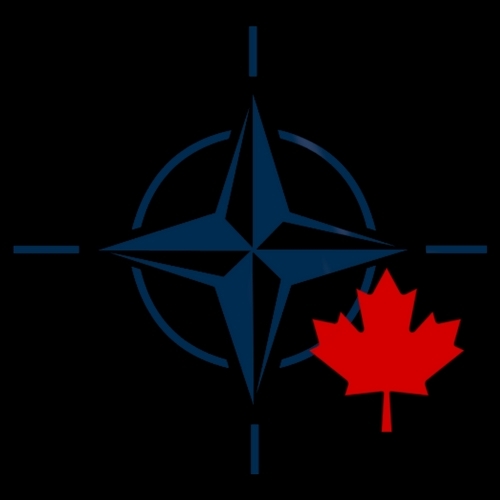 One aspect of Canada’s role in the NATO alliance that does get some welcome attention is the Canadian contribution to the International Security Assistance Force (ISAF), the multinational NATO force in Afghanistan. Canadian forces are contrasted positively with many of the European contingents they deployed with to Afghanistan, for whereas some European military forces had caveats restricting their ability to engage the enemy in combat – severely hampering their interoperability with other NATO forces – Canadian units were very active in the battlefield, unencumbered by restrictions on their mobility and use of force. Canadians acquired a much-deserved reputation in the Allied command for being reliable combat troops. One of the most delightful aspects of Defense of the Westis its user-friendliness. Sloan provides important appendices, including the text of the North Atlantic Treaty (1949), on which NATO is founded, and the text of NATO’s most recent Strategic Concept, the product of the 2010 Lisbon Summit. Sloan also provides discussion questions at the end of each chapter, making the text ideal for international relations or history seminars at the university level, reading groups, or personal study. 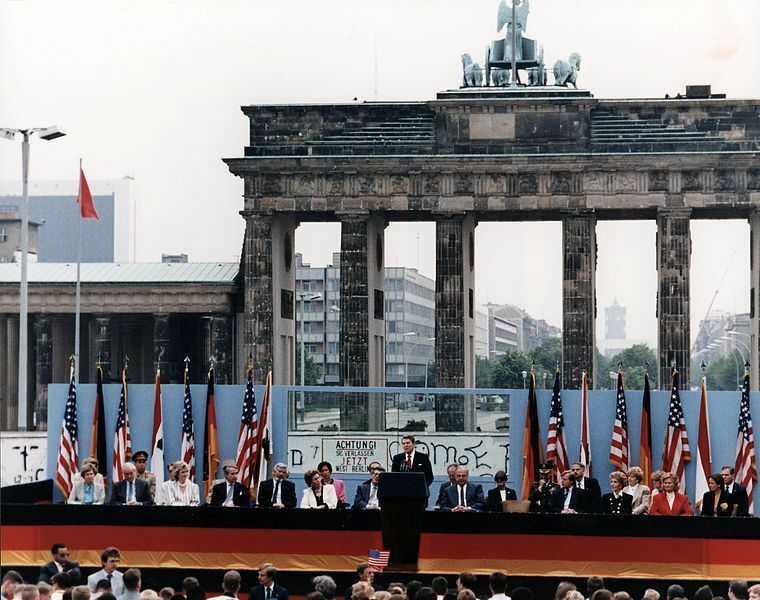 Picture: U.S. President Ronald Reagan delivers a speech in front of the Berlin Wall, in West Berlin, calling for the General Secretary of the Soviet Union, Mikhail Gorbachev, to “tear down this wall,” June 12, 1987. This image is the work of Reagan White House Photographs and taken from Wikipedia Commons. Public Domain.